Visual impairment is a global epidemic affecting millions of individuals currently. A large portion of these individuals suffer from chronic age-related macular degeneration (AMD), characterized by progressive neovascularization and vascular leakage near the central region (macula) of the retina. Current treatments for AMD, including laser photocoagulation, photodynamic therapy, and surgery, only benefit patients in the advanced stages and temporarily alleviate the progression of the disease. The need for more effective therapies has fostered the development of anti-vascular endothelial growth factor (VEGF) treatments. Although anti-proliferative agents have shown improved efficacy, repeated injections with 6-8 week intervals are often required to maintain therapeutic efficacy of these drugs, leading to inconvenience, higher cost and risk of injection-related complications such as endophthalmitis and retinal detachment. Regarding treatment, retinal specialists have identified the 2 greatest unmet needs as being reduced treatment burden and to develop longer acting/sustained released drugs. 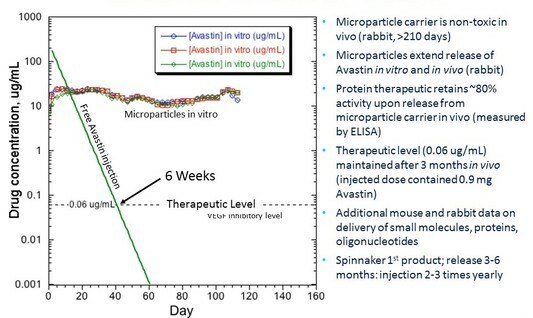 Spinnaker's controlled release drug delivery system addresses both of these unmet needs. even after 8 months in vivo.